Central TREC Group runs a rewards scheme to recognise participation in TREC competitions. 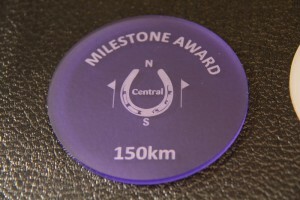 All members are able to request Milestones awards for themselves and/or their horse(s) based on the distance covered in the competitions that they complete. (Please note colours vary from the image shown, which was a sample). 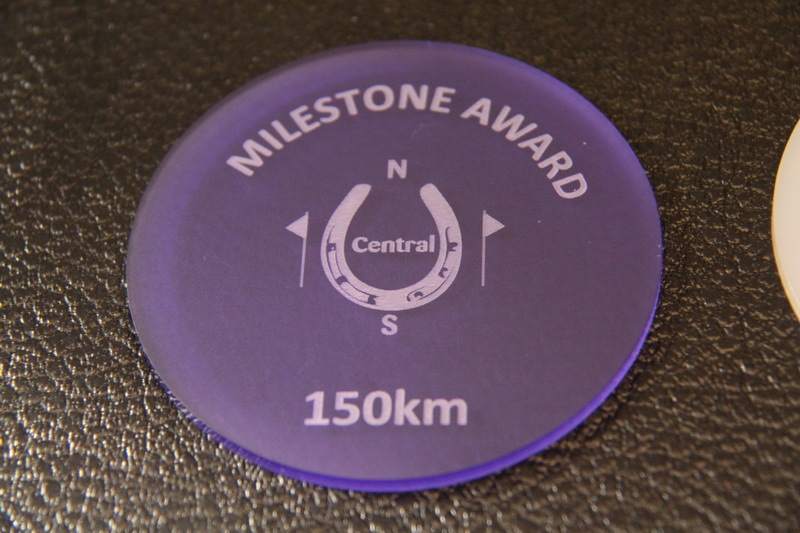 All affiliated TREC GB competitions can be counted towards Milestones Awards, no matter where in the country they are run (from Urswick 2014 onwards). Members can count any competitions completed while they are full riding Central members (not day or supporter members). Distance is cumulative and can be carried over from one season to another, but each member can only request one free Milestone in each membership year. Further Milestones can be purchased at cost price (£7.50), as long as sufficient distance has been completed for them to be awarded. Distance will be counted on a standard basis, 10km for a level 1, 20km for level 2, 30km for level 3 and 40km for level 4. Awards can be requested based on rider completions or for horses belonging to Central members, whether they were ridden by a Central member in that competition or not. Requests for horse awards should if possible be accompanied by a set of results showing the horse’s name. Members wishing to request a Milestone award should complete the attached form and send it to helen.martin@trecgroup.co.uk or Helen Martin, 7 The Woodlands, Geddington, Kettering, Northamptonshire, NN14 1BE. Forms must be accompanied by copies of the overall results or individual results sheet for each event being nominated for the award. Awards will then be verified and presentations will be made at Central TREC Group event prizegiving ceremonies and social events (eg the AGM or League awards evenings).